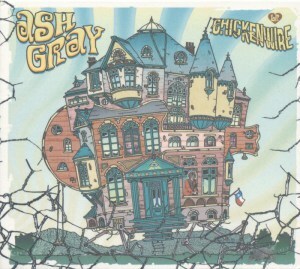 This is the third Ash Gray album I have reviewed on this website. From memory I can remember saying that 2012s Born in the Summer was so evocative of much of the psychedelic music that came out around 1967s 'Summer of Love' that I wasn't too keen on it, simply because it seemed to be such an accurate evocation that it felt too much like a copy. With 2014s Once I got Burned a rethink was forced because it was becoming apparent that Ash Gray was no mere copyist but a man who was not only hugely influenced by 1960s music but also had an absolutely natural affinity with those times. Once I got Burned however, was rooted to a much lesser degree in psychedelia and fairly solidly in classic country rock, something I had previously imagined he would be unable to achieve. So have there been further musical developments in the case of this new recording Chickenwire? You bet there have and to my ears this is by far his best album yet, with the music leaning ever closer to country rock, in fact it could be said that is its tap root! Having said that, Ash Gray is a man who is always going to retain that 60s experimental attitude and influence along with his completely unique individuality whatever genre we choose to put him in, so we shouldn't expect more of the same next time! Every one of these self penned compositions work beautifully on this ten song collection and even those that have more of a 60s psychedelic awareness are still rooted in 'country rock,' perhaps off the top of my head, containing similarities or at least shadows of an artist/band such as Matthews Southern Comfort, and it pains me to say it as a long time fan of MSC but Ash's songs seem much stronger, particularly as every melody is outstanding. Even the broad expanse of psychedelia and country rock sell this man's originality short, a little blues being detectable at times and much else besides leading me to conclude that he is not trying to latch on to any music genre in particular but has naturally come to a unique individual genre that has a purity of sound that he has achieved, probably unconsciously, thanks to his influences that have developed over the years. As can be imagined Ash Gray is never going to be simple to describe because I suspect he will always have those strong elements of experimentation in his music that will make him difficult to pin down despite these three albums carrying a recognizably idiosyncratic stamp. The one real constant on these three albums is his warm expressive vocal style that seems able to evoke any sentiment or situation and ties all of these recordings together. Of course it could also be said, after playing the albums one after the other, that even the thread of experimentation and the development from the virtual rigidity of the 'psychedelia' of 'Born in the Summer' through the psychedelia/country rock blend of 'Once I got burned' to 'Chickenwire' shows a consistency of, if not style, at least a flow of steady experimental development. A nice percussive intro with harmonica and guitar gets the albums opening song, The other man, off in bluesy fashion then Ash joins in on vocals on a song that bemoans the unsatisfactory state of affairs. The pace and beat echo a classic blues sound but with elements of country in the dobro and at times a noticeable edge of psychedelia. Golden road is a classic country or perhaps country rock ballad with acoustic guitar, beautiful steel guitar, dobro and an almost ethereal lead vocal from Ash allied to the the haunting harmonies that echo Matthews Southern Comfort or even at times Crosby, Stills and Nash. A haunting acoustic guitar gets Sundown (come see me) underway, soon joined by Ash's warm vocal and haunting harmonies on another strongly melodic song on which we are eventually joined by the steel guitar that gives the song a country edge. Latterly a cello comes in to join the steel guitar and the tempo changes slightly with the addition of percussion, with the song taking on a more psychedelic folksy edge before the final instrumental break takes it back to the experimental country feel. A speedy acoustic guitar and dobro gets When the Devil comes home going, then Ash's vocal comes in on a composition that has a strong, expansive country rock feel. It is a song on which the dobro seems to be equal in importance to the vocals, creating a rural rootsy atmosphere, although that edge of experimentation is never too far away, even including a musical saw for good measure with the vocals quite natural in the main and occasionally treated to make some textural variations. Finally, the title track Chickenwire has a haunting, ethereal intro with steel and acoustic guitars joined by Ash's atmospheric, otherworldly vocal. The echoing effects and latterly twanging electric guitar in conjunction with the steel turns the song back towards country with the musical saw strengthening the sound and adding a note of drama and mystery. It seems that nothing Ash Gray records has a contemporary feel, always having a preference for staying rooted in the 1960s and early 70s, which suits him (and me!) perfectly and I suspect will have appeal for most listeners thanks also to his warm expressive vocals, the gorgeous melodies and that incredibly strong experimental edge. And yet, despite that there is an element of modernity in his albums that could simply be, at least in part, because of the technology at his disposal we should not exclude later, perhaps even modern day music; all of our influences and preferences being subject to ongoing additions and in this respect Ash Gray is no different to most of us. He simply throws all of his preferences and influences, probably unconsciously, into the mixer and then what comes out, comes out rather than trying to be a disciplined member of any genre or sub genre! Long may he continue to thrive and develop his sound and certainly to my ears, from a good start he just gets better and better with every release. Whilst I love this album and its stylistic leanings I suspect that Ash Gray is never going to sit on the laurels that I'm sure will be forthcoming on the strength of this tremendous recording. I doubt that we will ever see (or hear) him jumping from one style to another, preferring as he seems to, a gentle experimentation and development. I for one can't wait to hear how his music develops on future recordings.